Hesitant to buy a Nokia N8 until now, because it's just a full touchscreen phone? 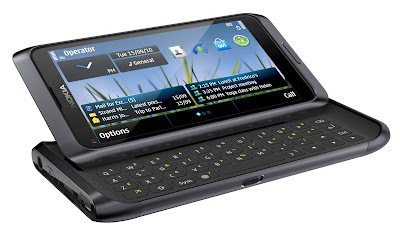 Hail the Nokia E7, a touchscreen phone with a slide-out keyboard. It's Nokia and it's an E-series phone, so expect to get a great deal out of the Finnish company's new business phone. You can pre-order your own Nokia E7 online until March 22, 2011 at the price of Php32,000. No pre-payment needed. The first 500 will also take home a Nokia DC-11k charger, a lightweight mobile power pack lets you power up two devices at the same time, for free! Initially available colors are Dark Grey and Silver White. To pre-order, just log on to www.nokia.com.ph/e7ordernow and fill in your Full Name, Email Address, Mobile and Landline Number. At the same time, you may select the preferred store where you want to pick up your Nokia E7 device and your desired phone color. Once submitted, an email will be sent to you to confirm your pre-order transaction. Print the email and present it upon claiming your pre-ordered device and free gift from March 26-28, 2011. Our techie genius friend Yugatech has posted his review on the Nokia E7. Read it and know more about the phone before you buy it. Additionally, the Nokia E7 can be used to access Mail for Exchange, Microsoft Communicator Mobile, as well as intranet and extranet portals built on Microsoft Share Point Server. At the same time, there's free Ovi Maps and refreshed Ovi Store where you can download tons of free applications.